Did you ever notice that when a car wash wants to emphasize their good treatment of client's cars, they usually use the phrase "Hand wash"? This is because they want to promote the fact that there is no machinery used at their establishment that can connect with your car and cause damage. It's a good promotional gimmick, to be sure, but in the final analysis, why should you have to choose between good treatment of your car or the possibility that it could be scratched or otherwise damaged? It doesn't make sense. Why not do business with a firm that takes the care of your car seriously, from the very beginning, and where there are no substitutes for good treatment of your car? That's the way it is every day with Elkhart Auto Detailing, in Elkhart Indiana. 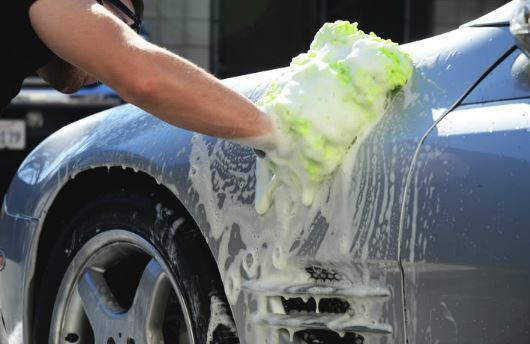 At Elkhart Auto Detailing we provide hand car wash work without charging hand car wash prices. This is because we believe that your car deserves nothing but the best. Besides, we don't want you to be satisfied with one visit to our service. We want to be a constant presence in the life of your car. Evaluate the Interior and the Exterior. This way we know what we are doing from the beginning and we can plan a detailing that will satisfy you. Carpet Cleaning. Our detailing usually starts with a cleaning of the carpeting inside of your car. We use stiff brushes on the floors and a treatment with aloe on leather. Duct Cleaning. Want the secret of a new car smell? It's a thorough duct cleaning, which we also provide as part of our hand car wash in Elkhart., IN. Non-Acid-Based Tire Cleaners. Many car washes, even hand car washes use acids on your tires to bring out the black color. Unfortunately, this also destroys your tires. We want to treat them better than that. The Hand Wash. Front and center of our car wash Elkhart, Indiana is our hand wash. After all, nothing could be more thorough or a more careful way to treat your car than that. Not even with a do it yourself car wash.
Clean Paint. There are few things that stand for a good hand wash than clean paint on the exterior of your car. With Elkhart Auto Detailing and our mobile auto detailing, that will be the most prominent feature of our work. Polish. If we had to send your car a love note, it would be in the form of a long and luxurious hand polishing as the final touch. That should always mark the end of a detail hand wash, and that's what we do. Why bother with a self car wash Elkhart when you can have the best in hand washes? Call Elkhart Auto Detailing today.